Treat yourself to a smoothing and toning ancient oil blend that’s safe for all skin types. Custom-made with the finest organic ingredients and herbal essential oils, such as Damascus rose, Pearlmoon facial oil is designed to nourish and rebalance the skin. A few drops applied to the face gently repairs and revitalizes skin, cultivating a natural, from-within glow. Pearlmoon Facial Oil comes in full- or half-ounce bottles. Receive a limited edition Pearlmoon Eye Pillow FREE with the purchase of each one ounce bottle of Pearlmoon Face Oil, while supplies last. Add the Eye Pillow to your cart and use the discount code “EYEPILLOW” at checkout. Pearlmoon’s artisan-made eye pillow is constructed of 100% pure silk, filled with organic flax seeds and lavender. It is the perfect weight to lay on your eyes, for a relaxing nap or rest. Make your purchase complete with Pearlmoon’s high-end, signature gift bag and tissue. A super cute finishing touch to any gift! Share the gift of balance and beauty. Wellness and rejuvenating sessions make thoughtful gifts and provide relief and relaxation for friends and family members of all ages. 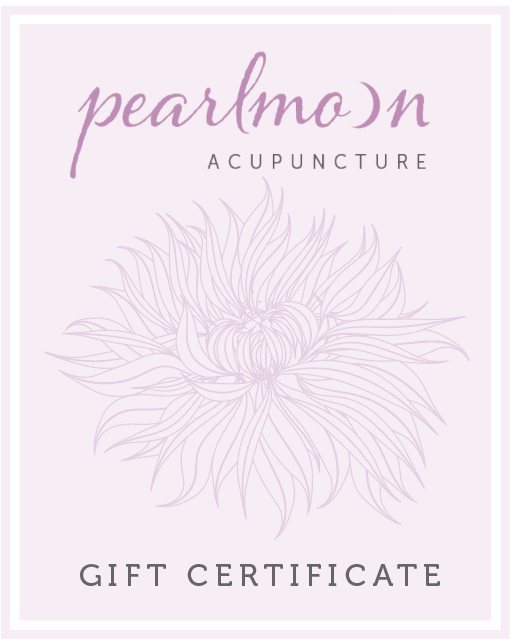 Pearlmoon offers gift certificates for treatment packages and products in various amounts, please contact us to purchase a specific amount.